Here are 10 tips that every owner of a Nespresso Machine Single Serve Espresso Machine should know to save time, money and get the best out of their investment. First off, have you picked up your Nespresso Single Serve Espresso Machine yet? If not, click here for some good Amazon deals. I also find that a good way to try a bunch of different espressos is to get a variety pack like this one. I also would recommend this great little organizer to help keep your coffee area clean and tidy. Enjoy reading the 10 tips to help you save time and money. An effortless way to save money. Preparation is key. Priming both your Nespresso machine and the cup you are going to have your coffee in makes a tangible difference to the flavor and in the enjoyment, you get from it. To do this, simply brew a serve of hot water in the Nespresso machine and then serve it in the cup or shot glass. This process also cleans out the machine so nothing interferes with the rich flavor of the coffee. Prepare in advance. Nothing takes the thrill out of a cup of coffee than, well, no coffee. Why put up with the agonizing wait for your shipment of coffee capsules to arrive? Purchase your capsules and stock up in advance so that the next time you want that invigorating cup, it is just a few minutes instead of a few days away. Your Nespresso is a machine of many talents. There is no need for a separate coffee maker if you want a cup of coffee instead of an Espresso. First, brew you a shot of Espresso and serve it in a cup, then, just remove the used capsule and run hot water through it into the cup. You will get a cup of coffee that is less strong than an Espresso and closer to an Americano. Your Nespresso really is a machine of many talents. There are two types of capsules available for Nespresso Single Serve Espresso machines — one is the standard Espresso capsule and the other is the Lungo variety and the amount of coffee they contain varies. There are corresponding settings on your machine and also you can ensure that the beverage you want comes out the best it can be by matching the settings and the capsule. Water is not just water. For best results in terms of both the longevity of your Nespresso machine and better-tasting beverages, always restrict the water that goes into it to the fresh and filtered variety. Not only will this fight the build-up of limescale inside the machine and keep it in prime working order, your drink will taste better, too. Take care of your Nespresso and it will take care of you At the very least, descale your Nespresso at least monthly, and more often if necessary. A brew that seems less flavorsome than before and not as hot as before are both telltale signs that your Nespresso needs descaling. Fortunately, descaling will reverse these problems immediately and you will be back to get the hot, delicious brew your Nespresso is capable of producing. Moreover, regular descaling prolongs the life of your machine. The settings are there for a reason. Watch a video on what all the different settings mean and how to adjust them for your particular model of the Nespresso. How you use your machine, the type of coffee you enjoy and the variety of capsule you are using all have an impact on what settings will be ideal. Make sure to recalibrate them so that you get the best-tasting coffee each time, every time. Cleanliness is next to godliness. The brew basket and brew head of your Nespresso machine are magnets for residue from oils and coffee grain. Remember to eject the spent capsule immediately after preparing your brew. Cleaning them simply involves running hot water through the basket and head. Do not ignore the tray either — stagnant water is an invitation for bacteria, and this unhygienic situation can be avoided with a straightforward daily wipe clean. Explore the options. 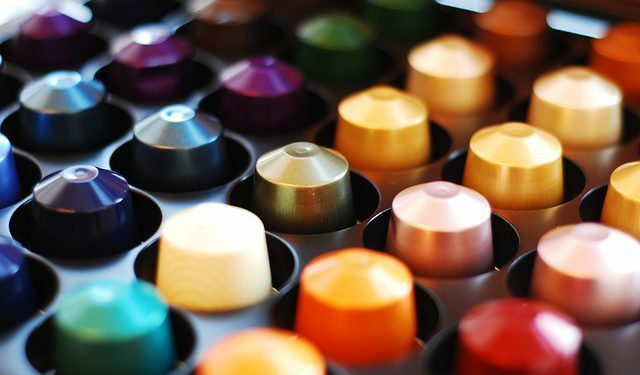 There are many alternative Nespresso-compatible capsules available and one such alternative are the capsules produced by High Line Coffee of New York, NY. They produce a wide range of flavors that many Nespresso users have added to their line of personal favorites, and you will even save some money purchasing directly from them. If there are 10 tips on how to save money and time using the Nespresso machine, There are also 10 tips on how to use a Nespresso machine. Below are the 10 tips. There is already a factory set in terms of the amount of water dispensed. the factory setting is 40 ml for espresso and lungo is 110 ml. If you are using compatible capsules the preset setting isn’t necessarily spot on. But you don’t have to worry there are 2 ways using compatible capsules. follow the instruction of the supplier of compatible capsules about the amount of water you should put in the dispenser. Weigh as you’re holding your finger on the button for the pod you’re using. If you want to reset back to factory settings, with most machines it’s just a case of turning the machine off, then pressing and holding the Lungo button for approx 5 seconds, until the lights start flashing. Check the room if it is well lit so you can clearly see the color of the flowing coffee. Start the flow, and then stop it according to the color changes into red/brown color. press and hold the program buttons to reset them to the new volume, or press to start then press again to stop. flow begins if you can see the red/brown color which is called the Ristretto color. When the color changes to a blonde/bright yellow color, the extraction are finished. flush small amount of water through the pod and into the cup. If you’re using a Ristretto pod, simply stop the flow when you notice the change from dark red/brown to a lighter, caramel color. For Espresso, stop the flow when the color changes from the Espresso caramel color to the blonde color. Most heat up time is 25 seconds. Put the cup under as if you were about to make the coffee. Press the button to turn the machine on, and without a pod in. Press the Espresso or Lungo button. Once the water has stopped flowing, open the machine to put the pod in, while the cup is still under. Empty the water from the cup. Put the pod in and press the button. It warms up the group head, warms up the cup, and gives the group head a rinse too. It has been said at the above that it gives the group head a rinse too, but we need to rinse it again after each use to prevent a build-up of coffee oils. You just only press the Espresso button again after making your coffee to rinse it again. Always remember that 90% or more of water are there in your coffee. If you don’t think water tastes of anything, just go buy a bottle of high quality still spring water, and taste test against tap water, and see if you can detect a difference. Many Suppliers said that gently shaking it or giving a light tap really helps. Usually, there is a slight bulge in the foil. check the foil for holes, and contact the supplier if the foil is flat or looks saggy. The circumstances if you still use this the flow of coffee seems to be different, and the resulting coffee doesn’t taste as good. Do not stick on that one compatible capsule. Try another compatible capsule to know their difference. and also to compare what is the best. We all know that priming and rinsing keep things clean. But there is some build up of coffee oils which you can’t flush with water alone, and which you’ll struggle to clean by hand as you can’t get to the parts you need to clean. So just run a cleaning capsule every so often to give everything a deeper clean. Descale your Nespresso machine at least once a year. And more often if you’re using unfiltered tap water. You just only have to get some Nespresso descaler. Follow the instructions from the descaling solution. And from your Nespresso machine manual in terms of how to get it into the descaling program. Try to experiment with other brewing methods. It’s nice to know something new on our own. We all know that Nespresso machine is ultra convenient. Also They’re great for drinking fairly decent Espresso style coffee on the fly. And I think they’re a great option for when convenience is required.